Both teams started slowly, but Logitech turned up the intensity in the second quarter and Tesla couldn’t keep up, losing 65-33. With Tesla riding a two-game winning streak and Logitech coming off their first loss of the season, this projected to be a tough, gritty game. The first quarter was exactly that. Peter Spadalik--Logitech’s strongest offensive weapon--came out cold and although his team created turnovers and fast break opportunities early on, they failed to convert more often than not. Tesla also started slowly on offense, perhaps stifled by Logitech’s defense, but they hung tough and were only down 10-7 after the first. The tables turned quickly in the second quarter. Though they continued to miss layups and easy shots, Logitech quickly overtook Tesla by brute force, conjuring memories of the early 2000s Detroit Pistons with their tough D and tenacious rebounding efforts. John Wie and Parker Ehret provided the offensive spark this week. Wie consistently hit outside shots and Ehret--who’s shown tremendous growth from last season--craftily chipped in a few buckets, noticeably trusting himself to let it fly when he got to his spots on the floor. 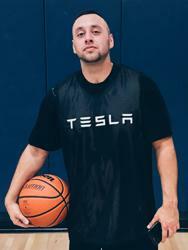 For Tesla, Aaron Visaya showed off a much improved jumpshot and scored six of their first nine points. All the hours he’s put in at the weekly WFA clinics are paying dividends on gameday, but his team went into the half down 36-18 after Wie drained a dagger three-pointer at the buzzer. In the third quarter Logitech continued to dominate, with Matt Pugmire snaring rebounds like a frog on a lilypad snares any fly that dares enter his airspace. As a last-ditch effort to get back in the game, Tesla threw a full-court press at Logitech to start the fourth quarter. It generated a few turnovers, but it was ultimately too little, too late for the team from Fremont.